Gone With the Wind is one of the most beloved novels and movies of all time. Margaret Mitchell’s Pulitzer-Prize-winning novel has sold millions of copies world-wide and has been translated into numerous languages. The movie, produced by David O. Selznick, is one of the most watched in cinematic history. With Vivien Leigh and Clark Gable, the cast is most memorable. But with all of the books and videos, one event is usually forgotten: the premiere of the movie in Atlanta. This is now remedied with Herb Bridges’s fourth book on Gone With the Wind. From December 13 to 15, 1939, the city of Atlanta was transformed into the envy of the nation. On the brink of World War II, Atlanta welcomed Hollywood to the South to celebrate the movie that would commemorate the American Civil War and its devastating effect on the South. With Clark Gable, Vivien Leigh, David O. Selznick, Olivia de Havilland, and countless others from the cast and production present, the premiere in Atlanta was the social and cinematic event of the century. This photographic essay contains photographs of the stars, of Atlanta before, during, and after the event, and of the citizens of the city who turned out not just for the movie but for receptions, the premiere ball, and other events. 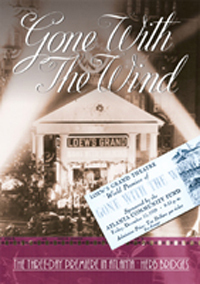 From movie stars to horse-drawn carriages, from a transformed theater to Gone With the Wind merchandise, this is the book that takes you back to an event often neglected in the Gone With the Wind story.